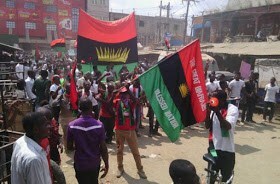 ​The Members of the Movement for the Actualization of the Sovereign State of Biafra (MASSOB) and Biafra Independent Movement (BIM) yesterday condemned the alleged invasion and destruction of its offices by the Nigeria Army during its military operation tagged Python Dance 11. They claimed that the destruction of office took place at Onueke in Ezza South Local Government Area of Ebonyi State. Addressing Journalists in Abakaliki,the Ebonyi Central MASSOB/BIM Leader Gideon Iloke alleged that some soliders numbering over 500 raided their Onueke office and destroyed their flags, emblems and other Biafra items and carted away other valuables belonging to the group. Iloke who described the attack as wicked and callous maintained that MASSOB was committed to the realization of Biafra Independence, adding that no amount of intimidation from the Nigeria Army or any other quarter would be able to stop them. He called on the leadership of Ohaeze Ndigbo under the Chairmanship of Chief Nnia Nwodo and other leaders from the zone to rise to their responsibilities of protecting Ndigbo from the calculated onslaught of the Nigeria military, which he said has been disguised as a fight against kidnapping and criminality in the zone. Iloke stated that if the leaders of Ndigbo fail to protect them against undue and unwarranted attack from the Nigeria security personnel, the group may be forced to take actions no matter how extreme in order to protect themselves. He further appealed to the international Community to beam its light on the activities of the Nigeria Military in the South East of Nigeria under the Operation Python Dance 11, pointing out that the activities of the solders in the zone do not conform with the rules of engagement anywhere in the World. “Last week the enemies of Biafra attacked our office in Onueke,chased away our members, destroyed our flags and carted away other valuables. “Everybody knows that MASSOB/BIM under the leadership of Chief Raph Uwazuruke is nonviolent in it’s approach to the agitation for the realization of Biafra Independence. “Therefore what was the reason for attacking our office? They should know that even though they attacked our office and scattered our men,I want them to know that MASSOB/BIM is everywhere in the World and no force is capable of killing all of us; Biafra has come to stay”, he stated.